Scubaspa Ying is one of the two boats of Scubaspa Maldives Fleet. 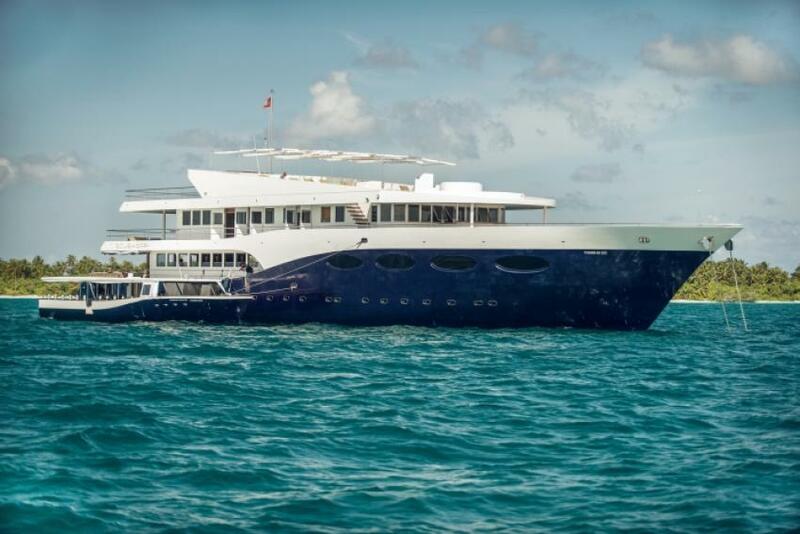 This yacht combines superb Maldivian diving and SPA on board. When you on a board of Scubaspa Ying it's all about comfort. Liveaboard can welcome 40 vacationers in 19 cabins. Seastar cabin is placed on lower deck. All are spacious and equipped with double beds. The main deck basically represented by social areas. Meals are served in a restaurant, that is located here. Also, Manta suites and Dolphin suites are located on the main deck of Scubaspa Ying. These are the biggest rooms on board, supplied with big panoramic windows with a stunning view. The upper deck is totally dedicated to SPA. Here passengers can use massage room, Ayurveda and aqua room. On the boat's sundeck, vacationers can spend time taking sun baths. Plus Scubaspa Ying has special Thai and Star deck with jacuzzi. Diving deck of Scubaspa Ying is located on lower deck. It has enough of space for all divers on board to be comfortable. Also, a boat has diving dhonies, that can bring you to dive spot, they equipped with multiple entry points. One of the main concern of boat crew is safety on board. Scubaspa Ying equipped with life jackets, safety ring buoys, defibrillator, and First Aid kits. SPA Treatments When it comes to Scuba spa boats it’s all about relaxation. What can be better than watching blue waters of Maldives enjoying massage or yoga on board? On Scubaspa Ying, you can choose one of the three packages: Scuba, Spa, Scuba&Spa. Also, for those, who not sure yet if they just want to dive or just get a spa treatment, Scubaspa Ying can offer tester packages. The boat offers a range of therapies from Asian, Ayurvedic, Thai, Balinese and traditional European origins. All treatments designed to suit your personal preferences. The experienced team uses only natural, organic ingredients. There are six rooms dedicated to spa and separate Thai Pavilion for yoga classes. Scubaspa Ying itineraries include diving on South and North atolls of Maldives, you will get a chance to dive at South Male Atoll, Kandooma Thila, where barracudas, grey reef sharks, and white tip sharks can be often seen. Also, this safari includes Whale Shark Watching at Maamigili Beyru. Choosing the North route you get an opportunity to dive with big gorgeous mantas of Maldives, visiting famous Fish Head. This dive spot is recognized between divers as a shark feeding spot. Maldives is a year-round destination for diving, but the best time to visit its dive sites is from November to May. June to November is good to dive with mantas and reef sharks, due to strong currents. I have been on many liveaboard vessels in my 40 years of diving. The Scubaspa is simply the best boat i have ever been on! The boat offers superb cabins and bathrooms, the dining room is spacious, the food delicious, the crew awesome. SIMPLY THE BEST!!! The team on the boat were excellent and the concept of the dive/spa combo worked really well for us. Unfortunately Scuba Spa's customer service and approach let them down. They had a late booking that wanted Scuba Spa Yang on an exclusive basis. Scuba Spa decided to move all those that had booked Yang on to Ying with no consultation - they informed us by email the day before departure, so late we had no option to cancel (we were on the plane when the email was sent). Nobody spoke to us on arrival to apologise. After much research we had specifically chosen Yang plus the change resulted in there being 28 divers on board - way above the advertised maximum of 22 which did impact the experience on many of the smaller fast current dive sites. Would I book with them again - I doubt it, do not feel I could trust them. When we arrived atthe boat the staff told us: just dive and do'nt worry about the rest. Just enjoy!! And they did it with a very high standards of service and diving. All the details under control to make us enjoy our holidays. All the staff with a smile and great and amazing efforts like the incredible barbacue, and all the moments trying to do all the best for us. Thanks to all the staff for this experience!.